Every great cook/chef (and us amateur bloggers know it too!) knows that in order to be successful in the kitchen, there are certain tools that we need to have to make those cookies come out uniformly (like our trusty cookie scoops! 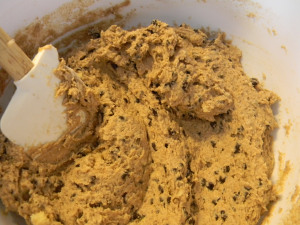 ), or to make that cake batter nice and fluffy (I rely on my trusty Oster Hand Mixer for that! ), and when it comes to mixing/combining/incorporating ingredients, I use my super versatile Rubbermaid Rubber Spatula! I would love to hear what you think – do you have a favorite spatula or kitchen tool? What gadgets/products can’t you live without in the kitchen?